RainbowYOUTH - Rainbow Youth’s Pride! 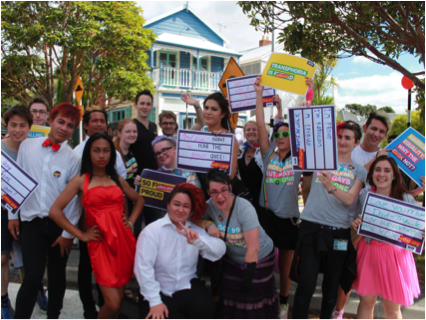 IN THE 12 years since Auckland’s last Pride parade, Rainbow Youth’s presence at the 2013 Auckland Pride Festival mirrored it’s growth as an organisation. The newly reinvigorated WTF campaign led Rainbow Youth’s involvement, with a market stall at the Get It On! Big Gay Out signalling its first public event. Here, the ballsy catchphrases of the WTF campaign were toted on signs by hundreds of people posing for photographs. THE SILO Markets provided another avenue for Rainbow Youth to get it’s ‘WTF’ on in a stall where people passing through could stop and have their photos taken with signs and learn more about the campaign and its aims. A highlight of this event was the newly married bride and groom who posed for a photo holding a WTF sign about marriage equality. RAINBOW YOUTH also dabbled in politics, organising the ‘Marriage is a Queer Notion’ debate. Run by Steven Oates, Team Nikki Kaye versed Team Jacinda Ardern, with all proceeds of the ticket sales (totalling around $2500) going to support Rainbow Youth. THE PERMIER event of the festival, attracting thousands of people who lined up along Ponsonby Rd was the Pride Parade, filled with around 40 floats and hundreds of marchers for LGBT equality. Leading the Rainbow Youth float came the board members holding up a ‘So F*cking Proud’ sign. Behind them came dancers, a ute, and rainbow youth members all holding various signs with WTF slogans on them. Quirky and extremely queer, Rainbow Youth was a part of a day that is likely to become one of the major events on Ponsonby Rd in the coming years.